With the Game Maker game(s) we have created so far (Catch a Clown and maybe Maze Game) we have gone straight into the game from a standing start, and come straight out of the game at the end. How much more professional would it feel if we had a proper start screen and a final closing screen to top and tail our game? The title and game over screens can each be represented by a separate room, possibly containing a background image, with the title/game over words either appearing as part of a background layer, or as an object containing a large sprite. Ideally, there should be a button to start the game on the start page, and buttons on the game over page to either replay the game or quit. To begin with, I want to create my start screen. One quick way of generating a start screen it to use a photograph. 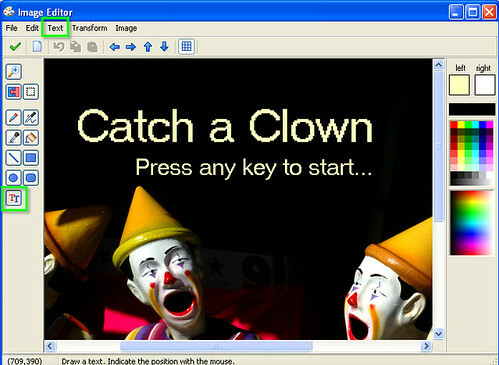 To add a start screen to my Catch a Clown game, I searched on flickr, the photo sharing site, for a clown photo, using the advanced search options to find photos that were licensed with a Creative Commons license (so I am free to use them) and allowed “derivative works’ (so that I can change them – by adding words over the top, for example)). Having selected an image, I downloaded the large sized version of it to my computer, and then loaded it into Game maker as a new background. If you open the background file in Game Maker, you can open the background image into an image editor and add some text to it (click on the TT button in the palette on the left hand side; set the font size from the text menu; set the font colour from the palette on the right. If you go wrong, ctrl-z should undo the last action!). Create a new room (rm_titles, maybe, or rm_start?) and add the background to it. Move the room to the top of the room list so that it is the first room in the game and the one that will be displayed when the game is started. If you run the game, you should now find that you have a title screen at the start of your game. Turning now to the maze game, my game currently just fizzles out when I get to the final room. In the Catch a Clown series, we looked at how to display a High Socre table (Who’s Best? Keeping Track of High Scores), which is something that might be good to add to the end of the maze game. But for now, I just want to add a screen with two buttons on it – one to restart the game, and one to quit. Again, I could add a photo background to the game over room, but I won’t for now, preferring instead just to have a simple coloured background. make sure the room is the last room in the game. What I do want, though, are a couple of buttons to press (rather than particular key presses) to restart or quick the game. One easy way of generating the buttons – which are going to be sprite images associated with relatively simple objects that spot when the button instances are clicked on (i.e. 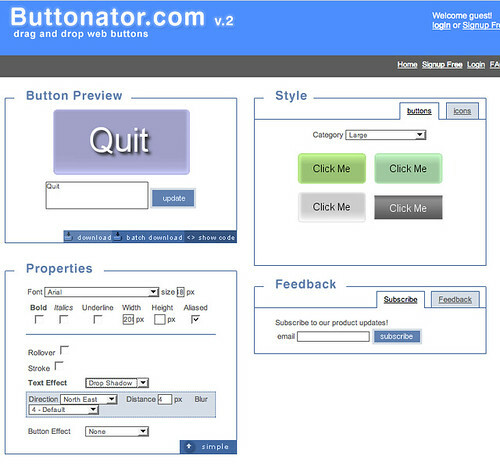 “pressed”) – is to use an online button generator, such as buttonator. Create your button, right-click on it to download it, and save it as a bitmap (.bmp type) image. It then then be loaded into Game maker as a sprite image. Create two sprites and two objects (one to quit and one to restart, in each case) and add them to the room. Can you work out what actions to add to the button objects? (How did you configure the clown object so that the programme recognised when a clown instance was clicked on?) Try it and see…. If you have not already done so, add a left button/end game event/action pair to the quit object, and a left button/restart game event/action pair to the restart object. So that’s it – you should now be able to add title and end game screens to your game and make them just that little bit more complete…. ha its very good now it looks like a propper little game. i love this course!!!! My end screen won’t come up, it goes to the highscore table then just ends without going to the final screen. Could you give some hints as to what I could try? I used Glassy Buttons http://www.glassybuttons.com/glassy.php to create my quit and restart buttons. The website is easy to use! I created 4 sprites spr_quita, spr_quitb, spr_restarta, spr_restartb. I also created two objects obj_quit and obj_restart. For obj_quit I assigned the sprite quita. I added two events. When ‘left pressed’ action ‘change sprite'(and choose quitb). When ‘left released’ action ‘end the game’. For obj_restart I assigned the sprite spr_restarta. I added two events. When ‘left pressed’ action ‘change sprite’ (and choose spr_restartb). When ‘left released’ action ‘restart the game’. Try it out! I know it said above ‘load both images into the same sprite’… but this is an alternative. Im having a hard time finding a good picture can anyone help? Finished! It’s not quite how I pictured it, as it sort of took on a life of it’s own as I was developing it, but I am quite chuffed with it nonetheless. … I can’t seem to find out how to get the room to change when the player gets to a certain score and I can’t find information about rooms changing in previous activities? hi im creating a game for my class. i created a picture in fireworks. The picture is a question with the choices of a b c or d. From there im going to open it in a room. i was wondering how i can click each answer choice??? and when i click how to put if it was wrong or correct.